WIA-Loader is a tool which can load images from a camera or memory card. 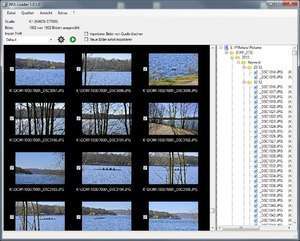 The program supports uploading of images to FTP servers or creating HTML photo albums but also supports GPS data and as such can read both GPX and EXIF data. WIA-Loader can create folders, manipulate EXIF data, change the picture data's last modified date to the "photo taken" date and more. The program is easy-to-use and supports mainly JPEG photos from most brands of digital cameras. Version 1.9.4.2 is a freeware program which does not have restrictions and it's free so it doesn't cost anything. For security reasons, you should also check out the WIA-Loader download at LO4D.com which includes virus and malware tests. Additional screenshots of this application download may be available, too. Offering up some programs handy for usage with your digital camera including photo manipulation, touch-ups and other editing tools perfect for use with you Canon, Nikon or Sony digital cam! Check out some of the freeware downloads available in the digital camera software category. They contain no strings and are available at zero cost.